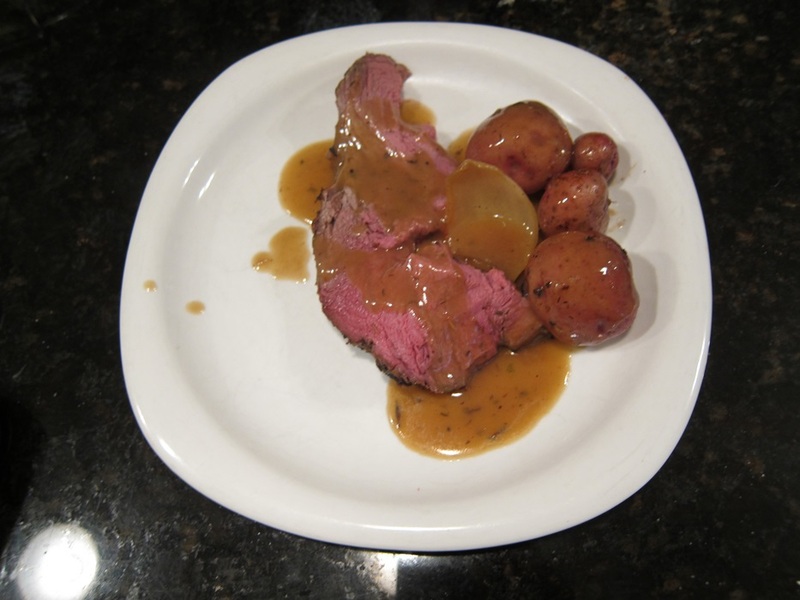 This is a kind of loose recipe for a pretty delicious roast, and an excellent gravy. Got this stuff at the Scottish Highland Games last year. Roll the roast in your chosen herbs. 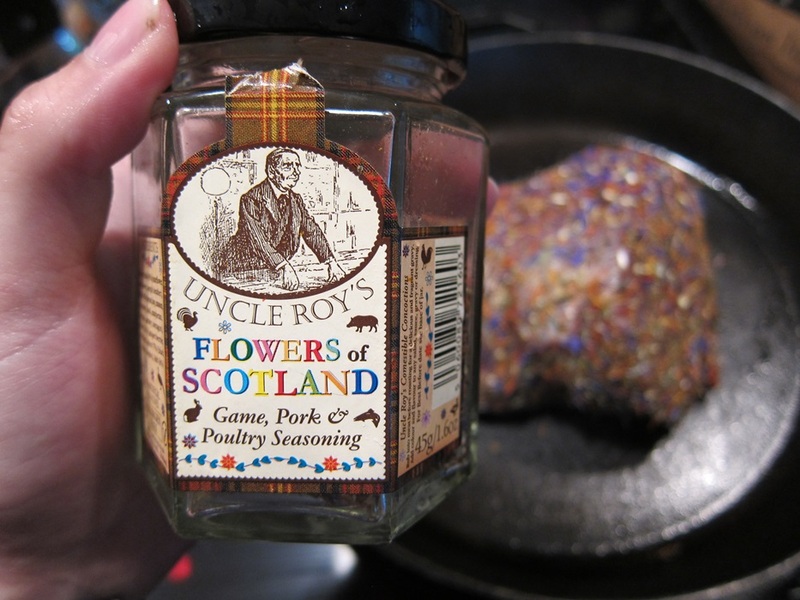 The Flowers of Scotland mix is ever so pretty! Preheat the oven to 275, and heat a cast iron pan over medium high heat. Sear the meat for two minutes on each side. Add the potatoes and other vegetables to the pan and drizzle some olive oil over them. 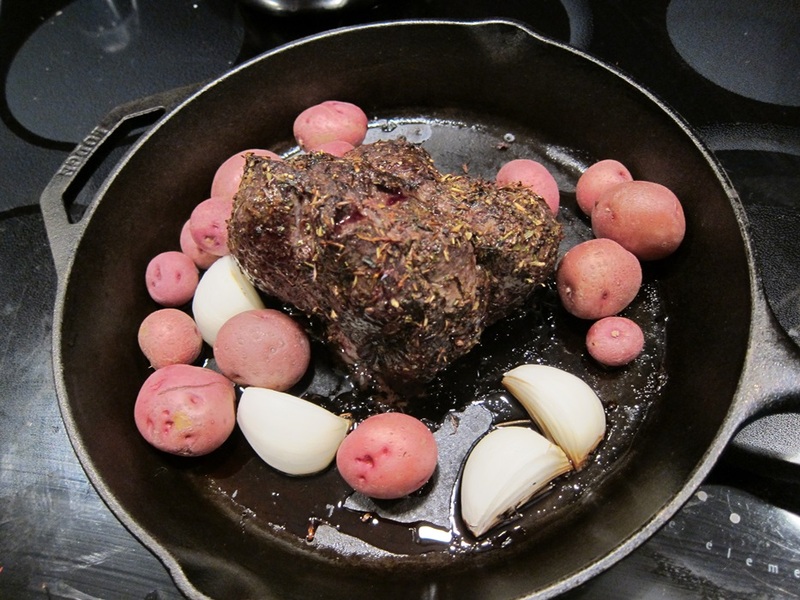 Stick a meat thermometer into the center of the roast, and put in the oven. Cook until the meat reaches 130 degrees – when you take it out of the oven, the internal temperature will still rise several more degrees. I think our 2.2 pound roast took roughly 2 hours, but I accidentally turned off the thermometer before looking at the timer so it’s hard to say. I forgot to drizzle oil on the potatoes before putting them in the oven, so they look dry, but they bounced back, and you can prevent that anyways if you don’t forget! 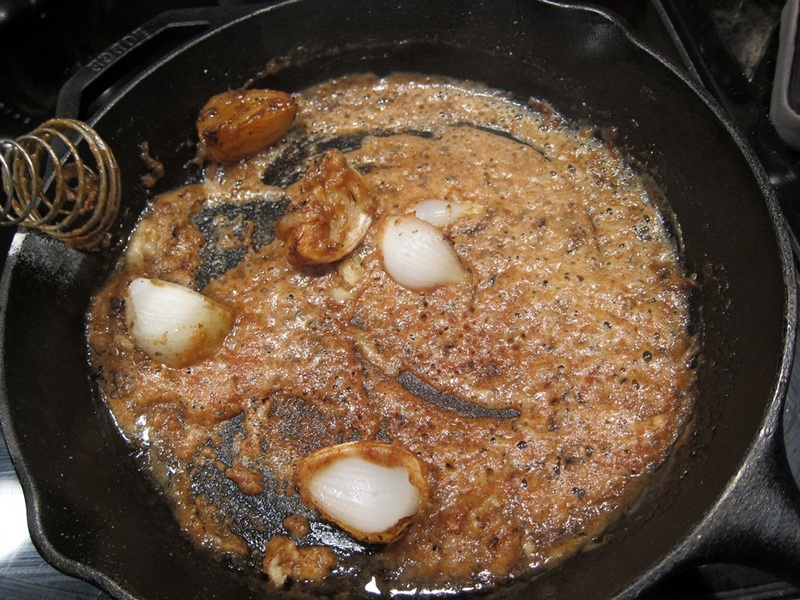 Remove the meat and all vegetables except for the onions from the cast iron pan. Put them on a plate, cover it with foil, and set aside. Put the cast iron pan back over medium high heat and add the butter. Once the butter has melted, add the flour and stir into a paste. 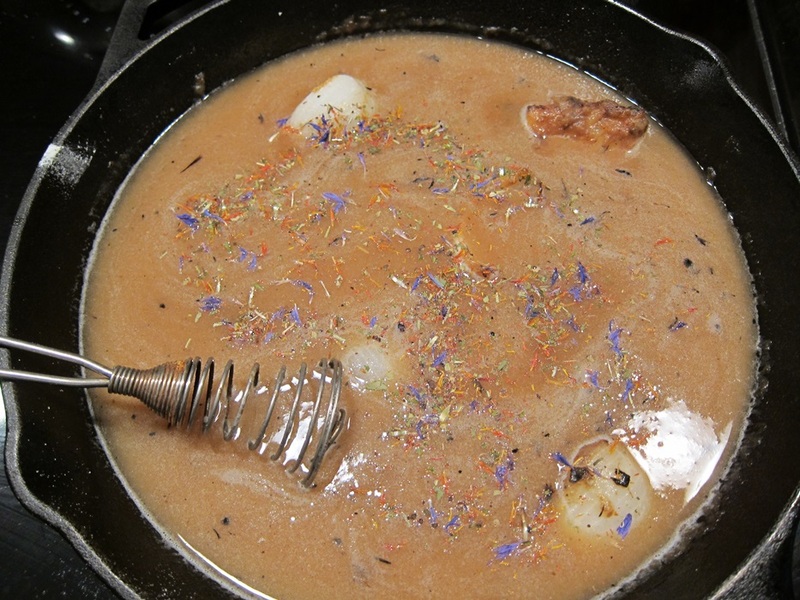 Add the wine, then the broth, then sprinkle in another two good pinches of the spices you used on the meat. Cook until thickened. With that much liquid, I thought it was going to take forever, but in under 10 minutes it was a good gravy consistency. Knife skills do not run in my family. 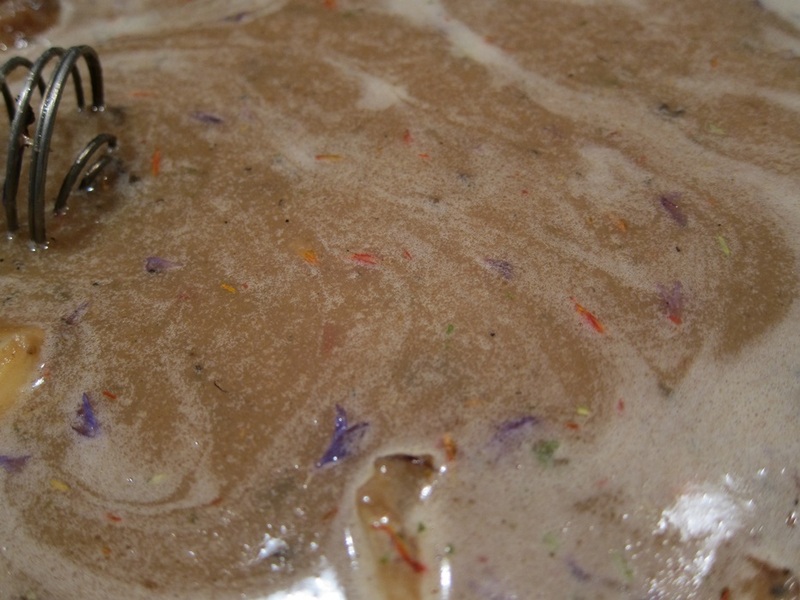 Serve the meat and vegetables with gravy. 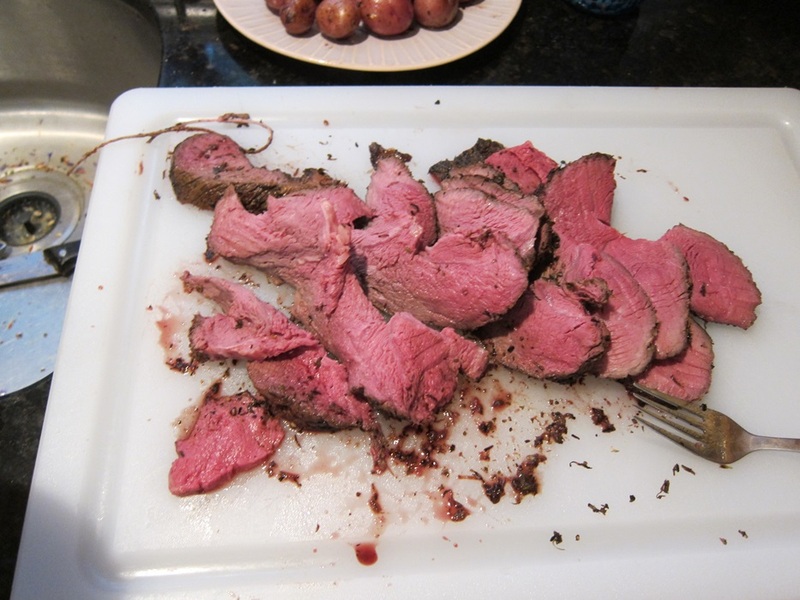 This was a perfectly textured rare roast. If you like your meat more well done, cook to 140 for medium, or 150 for medium well. 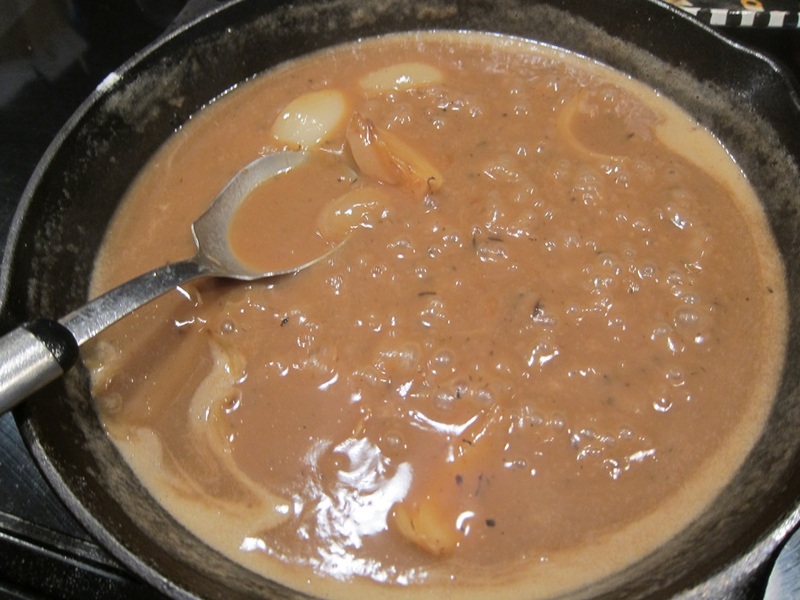 This recipe made more gravy than we needed for our 2 pound roast, but the gravy is great, and well worth saving for some potatoes or something later. 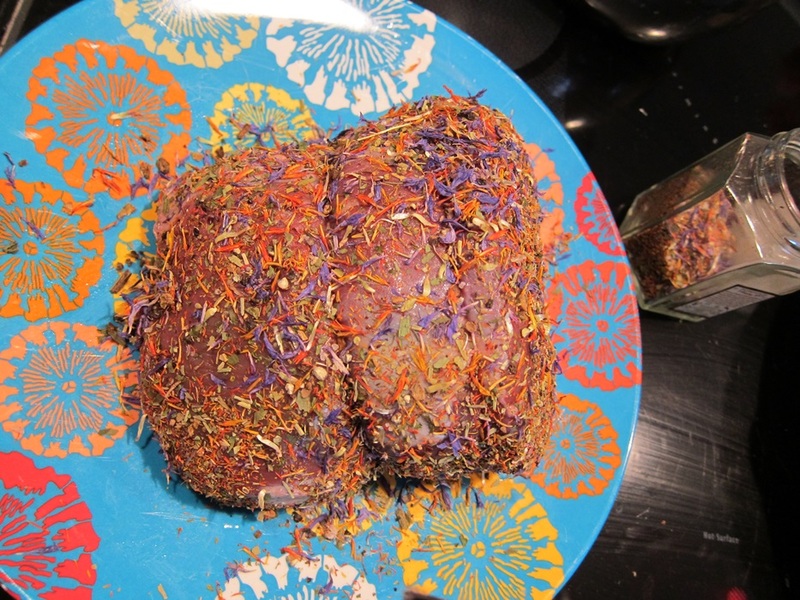 Roll the roast in your chosen herbs. Preheat the oven to 275, and heat a cast iron pan over medium high heat. Sear the meat for two minutes on each side. Add the potatoes and other vegetables to the pan and drizzle some olive oil over them. 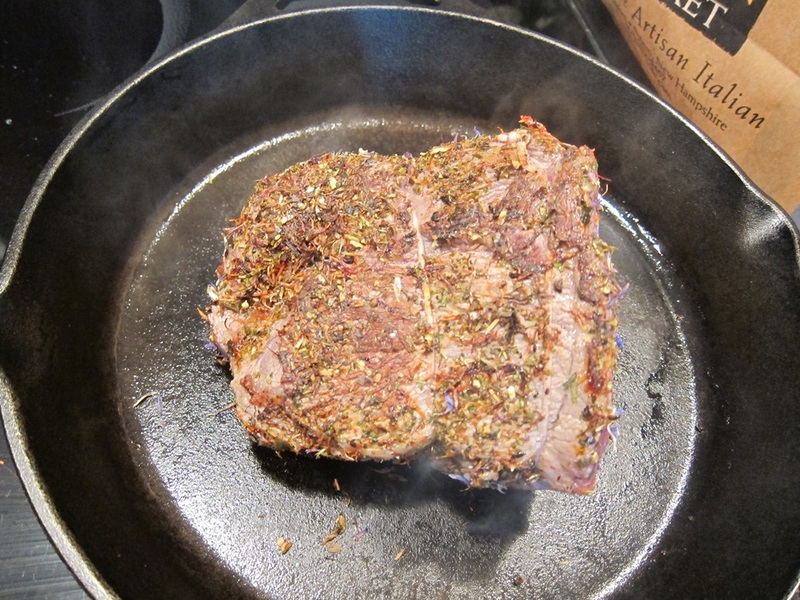 Stick a meat thermometer into the center of the roast, and put in the oven. Cook until the meat reaches 130 degrees. Add the wine, then the broth, then sprinkle in another two good pinches of the spices you used on the meat and cook until thickened. Slice the meat and serve with vegetables and gravy. 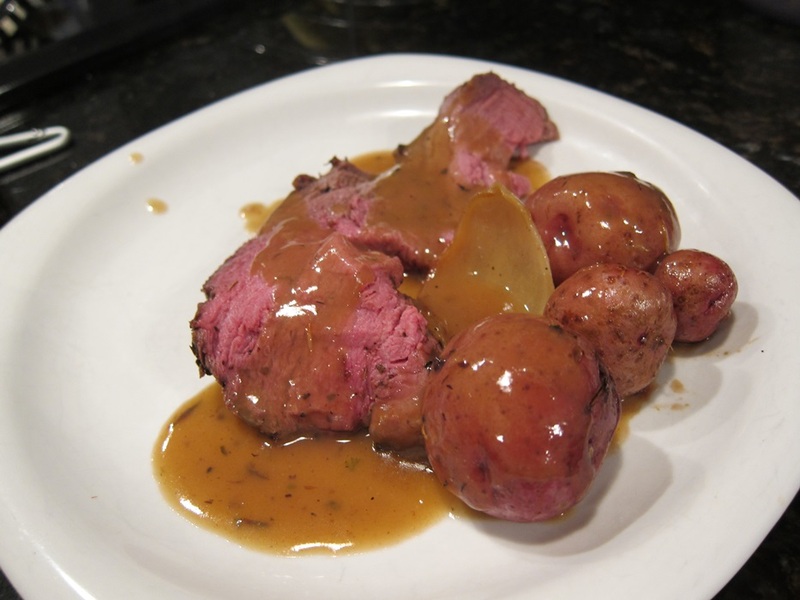 This entry was posted in Dinner and tagged gravy, meat and potatoes, roast, sirloin. Bookmark the permalink.